"If you have a penguin in your life then you need a GNU to go with it." 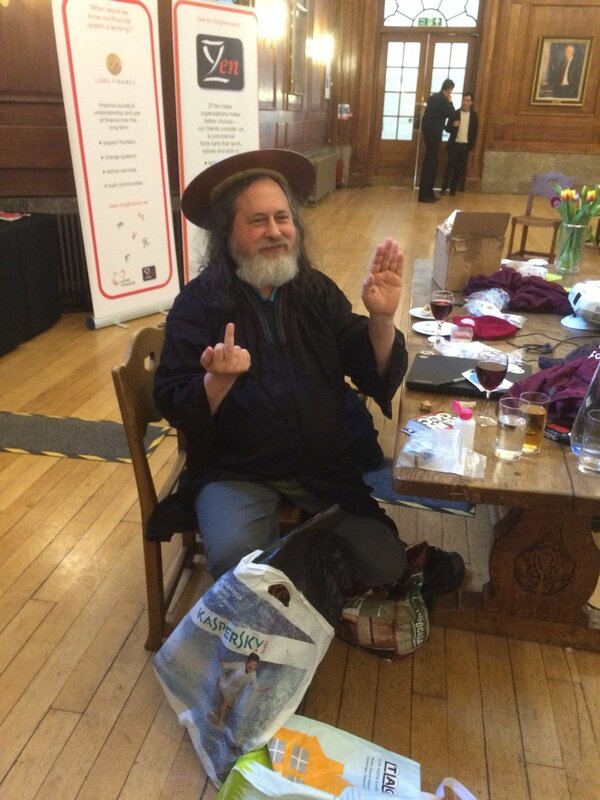 I was in London on Friday (Feb 16 2018) and at lunchtime I managed to steal a couple of hours to see Richard Stallman give a lecture in the Great Hall at Goodenough College. The room got to about 3/4 full with maybe 100 people in attendance and the demographic was surprisingly diverse. At the kick-off time of 1300, the speaker was nowhere to be seen. His abject refusal to own a mobile phone meant that no one was entirely sure where he was. Stallman started out as a programmer, creating the GNU Operating System and now mostly travels the world lecturing on the benefits and importance of Free Software. He’s known in technology circles for his extreme views and his eccentric nature, but also for his essential contribution to the world of modern computing. Anyone who has ever used a computer since the 90s owes something to the Free Software movement and the GNU project. At 1310 he strides into the room - he got stuck in London traffic. “The delayed start of the lecture was caused by the late arrival of the equipment.”, he says. That gets a laugh, then he unplugs the Windows laptop they set up for him, a crowd pleasing move amongst the GNU/Linux fanatics. Immediately he lays down some ground rules. It’s fine to record the talk and take pictures, but your photos should not be geo-tagged as that helps feed the mass-surveillance system currently in operation on the internet. If you post stuff online you must make it available under a Creative Commons License and please don’t post it to Facebook, Instagram or WhatsApp - “they are all tentacles of the same surveillance machine, don’t feed them information about me”. The lecture was titled “Divide & rule on your screen: Copyright, antisocializing contracts, and Digital Restrictions Management”. Not the most accessible name but he quickly gets to the point: services like Amazon & Netflix place restrictions on what you can watch and how you can watch it. In doing so they are anti-social and impinge on your freedom. The popular phrase goes - ‘free as in free speech, not free beer’. It’s perfectly fine to charge for software, you just have to disclose how it works and let people modify it to their requirements. This is usually done by publishing the ‘source code’ - a human-readable set of files that go together to build the program you eventually run. The term ‘Open Source’ goes some way to helping explain this, although Stallman rejects the use of it, seeing it as only one part of the equation. So for example, because you can’t play Netflix shows on software that you can inspect you never really know what it’s doing to your computer, or what exotic servers it’s sending out data to. It’s not just movies and TV. A great example is when Amazon started removing books from Kindle devices or as he calls it, “The Amazon Swindle”. In a funny twist, the book they removed was Orwell’s 1984. There are countless other examples that stand to prove his point - Apple forcing a U2 album on iPods, apps vanishing from devices, Windows 10 magically installing on machines… the list goes on and anyone using technology in the 21st century has probably been bitten by this at some point. The lecture meanders around a few points - connected devices that report on you, mobile phone tracking technology (“Stalin’s dream”), convenience at the cost of freedom, Windows (“the universal back door now known as the auto-upgrade system”), Fitbit and Apple (“they call it jailbreaking because it’s a jail”) - before circling back to DRM and copyright law. He speaks with such clarity and conviction that it’s hard to disagree with him. If you can’t study and modify software, then you don’t control it - it controls you. Stallman in action after the lecture. Photo: Dmitry Demenchuk. Towards the end, to everyone’s surprise (and the snooty college staff’s horror), he starts auctioning off a cuddly toy of a Gnu (“if you have a penguin at home you need to get a Gnu”) to raise funds for the Free Software Foundation along with a book of his. Then he sets up a table and starts selling T-Shirts and stickers. It’s an odd but funny moment that perfectly sums up a man who doesn’t care what people think of him. A man who lives and breathes entirely for a cause. The notion of free software is pretty much as old as personal computing itself. However, in 2018 the importance of it is more relevant than ever. A few big corporations control your digital life and yet technology is at a stage where it really doesn’t have to be the case. If there’s one thing I wish Stallman would stress more is that it’s not all doom and gloom. On the front page of his website he tells people “what’s bad about [insert company name]”. He needs to take a step back and see what he has achieved. He focuses on the bad and assumes everyone knows about the good. Hardware is cheap, the internet is readily available and Free Software is in a better place than it has ever been. I am writing this on a machine that doesn’t randomly update itself, doesn’t run software I don’t know about and doesn’t leak data all over the internet. If you want to live exactly as he does then you have to make a lot of sacrifices, for sure. However, if you just want a free operating system that doesn’t spy on you, that you can use to write on, edit videos, listen to music etc etc - it can be done without many compromises at all these days. If you want to dig in and modify the software you run, you can. It saddens me to see my friends wrapped up in monthly subscription deals and locked into walled gardens but the current state of Free Software gives me hope for the future, not fear. Due to its very nature it cannot be taken away from people and therefore it cannot die. When people are ready it will there for them. If you just want to dip your toe in the water then I would just try any GNU/Linux distribution, ignore Stallman’s objections for a bit. Do some reasearch and pick your own or just go for xubuntu which is my personal favourite for beginners. You will be surprised at what you can do without Microsoft or Apple. If you are interested in going to see Stallman there’s a list of events here.